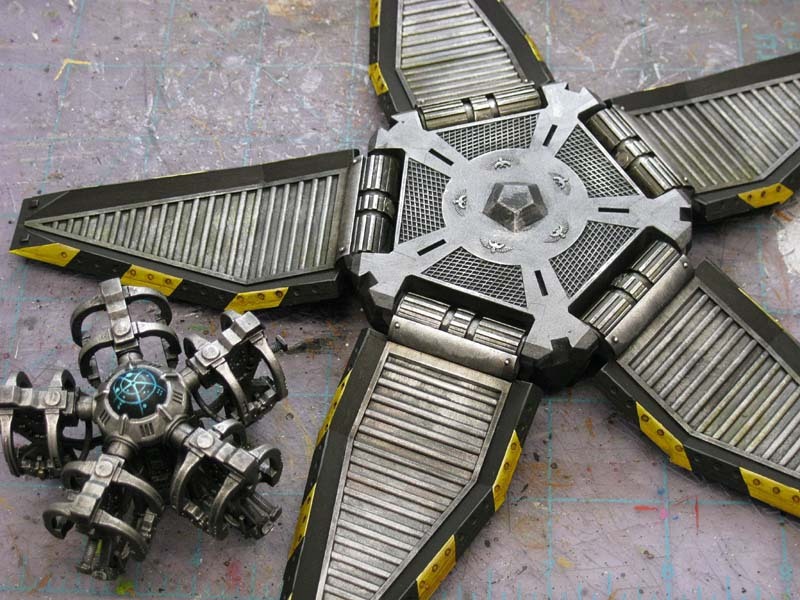 Now that I've got this drop pod built and sitting on my desk in three pieces... it's time to get it painted. I built it this way I did for three reasons. 1. I'd never built one before. 2. It needed to be magnetized. 3. I didn't want to try and paint all the recessed areas afterwards so I made an effort to build it in three sub-assemblies to make this part of the process all the easier. 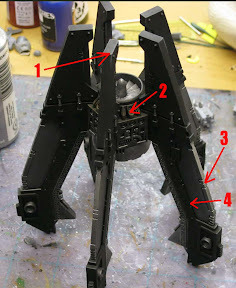 The complete drop pod building process can be found here. 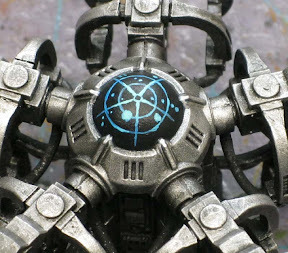 Even if you don't magnetize your pod, I'd definitely recommend painting it like this to make it super easy to do. This post will also include how to create a chapter icon for your doors. A few come with the drop pod and that's great if you're running one of those chapters, otherwise you're out of luck. The final construction of the completed pod will be included in a short follow up post since this one has grown to a near impossible size. I used a combination of black spray paint followed up with bottle black for touch ups to get this model primed. I started by priming the whole thing black. Before I did that though, I made sure to "mask off" the seems around the doors. I did not want paint in there if I could help it. It would only make getting the doors open and closed that much tougher. With all the pieces primed, I started on the center console first. All of the metal areas are given a basecoat of gunmetal color. That's followed with a wash of GW Badab Black and then a drybrush of a silver color for some added contrast. I also went through and picked out a few small details on the console like the odd power cable here and there and anything else that catches your eye to break up the sea of metal. It doesn't have to be much, just something to break up the huge mass of metal you have. The center console dome was painted to look like it was some kind of digital map-sphere tracking thing. I cleaned it up by painting it black first. The lines were added with a light blue color. The whole thing was given a wash with SW Sapphire and the center was wiped clean to give more contrast. The final step was to go back over some of the dots with the original light blue line color for effect. It's basically how I paint power weapon effects just with different lines. A further discussion on Secret Weapon washes can be found here. It's worth mentioning that I did not "shake" the blue wash up prior to using it in this case. The whole key is being able to clean up your work with the black paint so that you don't have to worry if you get some gunmetal or silver on the wrong thing. If you are careful, it will minimize the amount of cleanup you have to do, but it still saves time in the end. 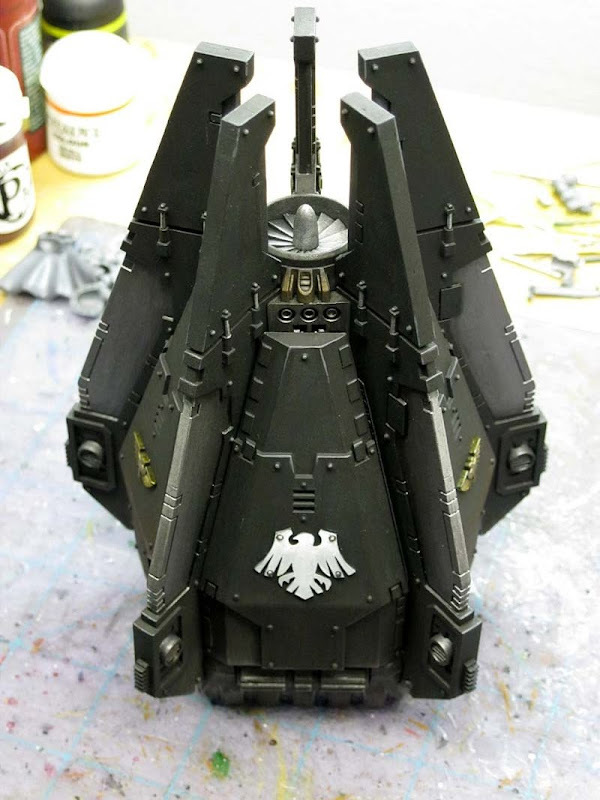 If you were painting the drop pod some other color like red or blue, now is when I would do that. 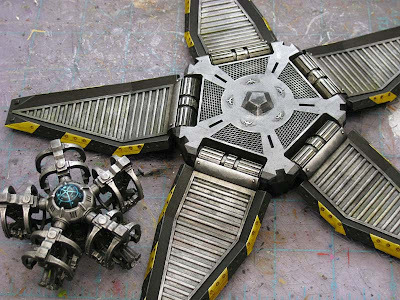 With all the metals done and cleaned up, you could go in and add your actual drop pod color to the remaining areas. You would be able to leave the black in the recessed areas in between your pod color and the metal areas to help separate them and add contrast. The same approach for the metal is applied to the portions of the fins where you want metal. Here it was on the inset portion of each stabilizing fin. 1. A sharp light grey line highlight was added to the upper edges of the fins and any elements that stood out. 2. The upper engine was painted metal and then given a soot stained appearance. 3. The same edge highlight was applied to the metal area here but much more carefully than just drybrushing it on like I did for the center console. 4. The wash of GW Black was also carefully applied here (in the recessed area) since the overall area is so flat and I didn't want to run the risk of it pooling up and leaving edge marks. I start this by painting the inside completely and then the outside of the base/door assembly. The metals are done the exact same way as before and after you clean up around the edges, you can go in and add the hazard stripes to the edges of the doors as an added feature. They can be a little time consuming to do, but I think they are well worth the work in the end. It's not hard to do once you look over this step by step process for laying them out and painting them. 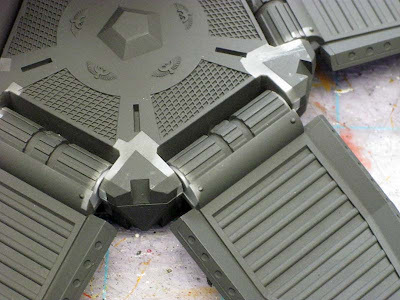 I also do the weathering to the floors of the ramps at this point as well. Don't do it to the floor of the inside of the pod just yet... limit yourself to the ramps only and we'll get the rest of it once we assemble the whole thing. Great post, Ron. 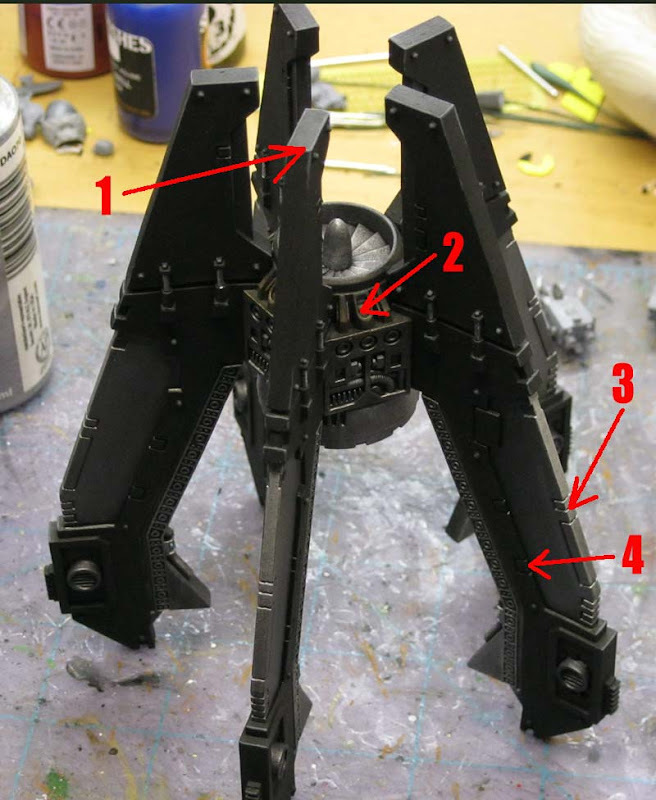 Pretty much what I did with mine, though I primed and painted at an even lower level of sub-assembly. Oh wow, that is one crisp lovely pod. I need to work on my lines, that looks very nice. This is simply amazing! Although I haven't used a drop pod in a long time the links hidden throughout this article is a great example of why I read every article! I plan to do up some power swords now and am going to to go back and soot up some of my vehicles. ServvsUmbrarum: I'm glad you like the links throughout. It takes a bit longer to put a post together, but I think they are a little more complete in the end with all the resources there for someone to duplicate the process on their own.